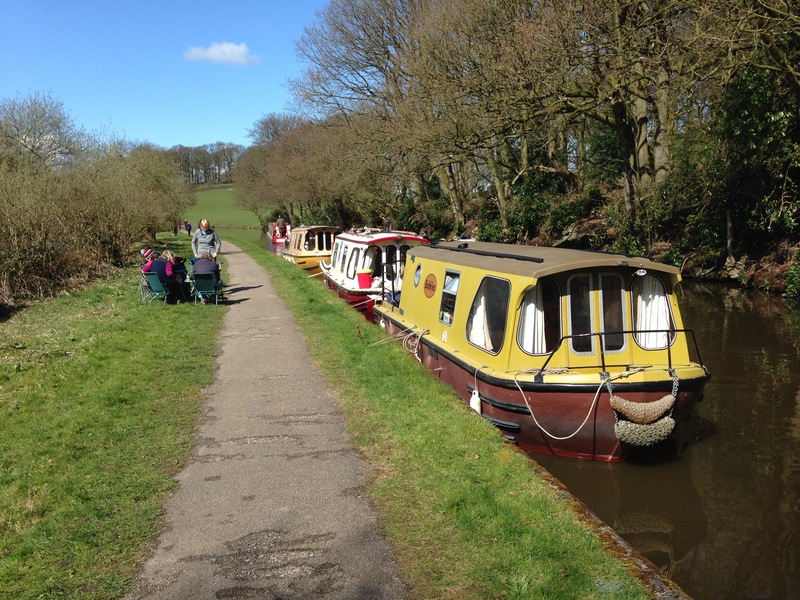 Three groups of friends spent this Easter cruising up’t north, mind you for two of the boats almost all UK canals are north of our home bases. 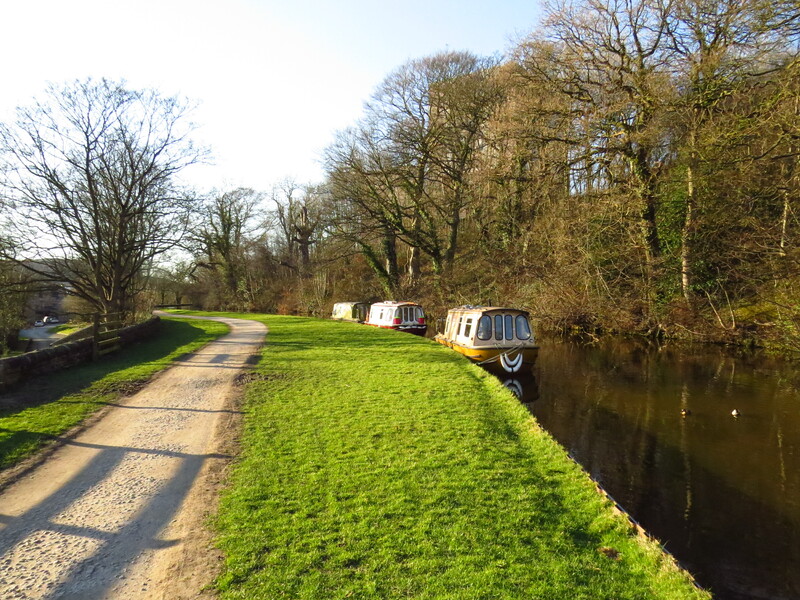 With much planning and suggestions by those who have cruised over the route before, Bobbles, Sloe and Tophyl set out for the Leeds and Liverpool canal, with a view to travel from Lancashire to Yorkshire. 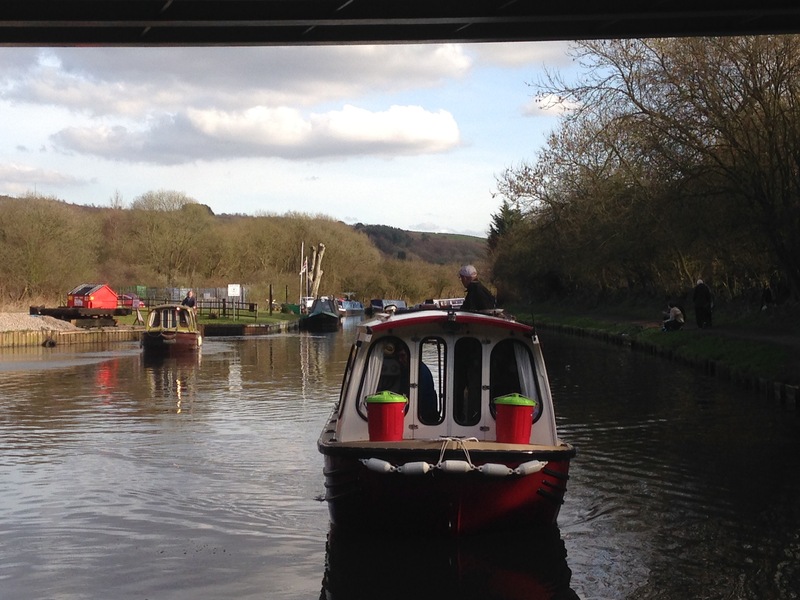 We were to launch at a CRT slipway at Botany Bay, Chorley and to cross the Pennines and to finish at Selby Boat Centre on the Selby Canal, near Aire & Calder. As usual with the Easter weekend approaching, the weather that had been fine and cool for over two weeks, was being forecast to become unsettled and rain was forecast by the time we planned to launch. 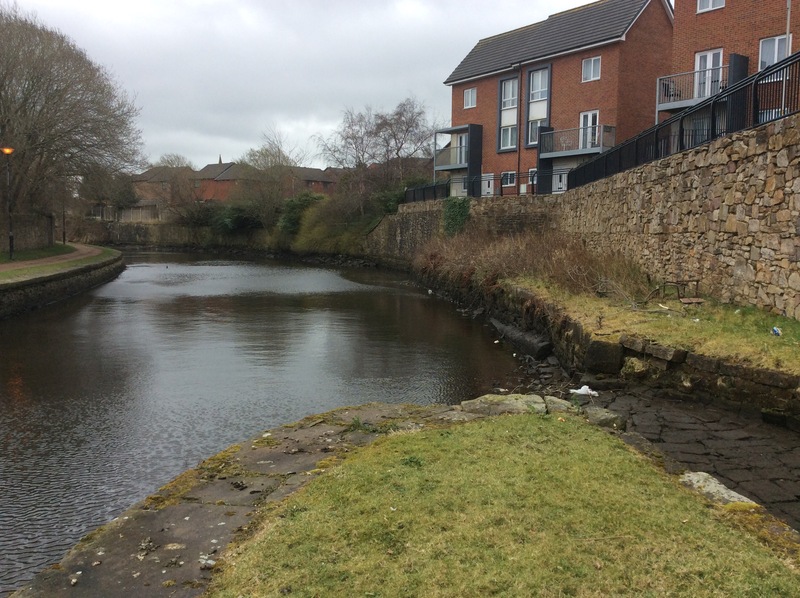 After some contact with the CRT regional manager over the preceding weeks, it was agreed that we could use their Botany Bay slipway and they would ensure that it was clear to use. For Health and Safety reasons, they would also ensure they had staff on hand whilst we launched. Just on an editorial point of view, please note that all photo thumbnails can be clicked on to see a full sized picture and that the blog has been updated and some new photos added since our return from the cruise. Bobbles arrived first at around 10.30 and launched with no problem, however there was a metre wide strip of earth & wet grass above the concrete slip and below the hard roadway, which was to prove interesting later on (as can be seen in the photo below). 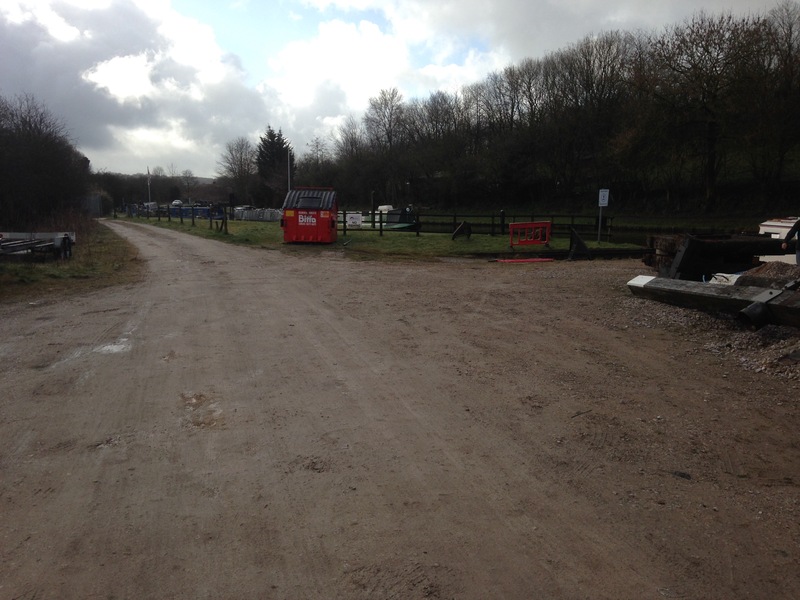 There was plenty of space around the top of the slipway to turn around and store the cars and trailers until the planned transfer to Selby, as well as a convenient water point. Around noon, Sloe and Tophyl both arrived, as did the rain. Sloe launched but the now wet earth/grass strip proved to be a problem for Sloe’s car, which had a problem getting over an earth hump, even in 4 wheel drive, without one wheel slipping. This was soon overcome however with the aid of a tow rope and another car, as well as some man handling of the trailer. Finally Tophyl was launched, this time with no problem but it may have helped as it approached from a slightly different angle to try and miss the slippery area and had every diff lock engaged when the trailer and car were coming out. With all the boats launched it was time to dry out and arrange for dinner, so we used one boat to cruise up to a Chef & Brewer pub, The Malthouse, where we had a nice meal. When we returned and cruised back to the other boats, the rain had thankfully stopped. Car and trailer transfer day and wouldn’t you know it, the sun is out. Off we went on an 85 mile journey using the M61 but south this time. Then around a bit of the M60 and on to the M62, through miles of road works. The motorway was busy, but we made good progress and arrived in Selby, at the Selby Boat Centre, where they helpfully found space to store the three cars and trailers side by side. 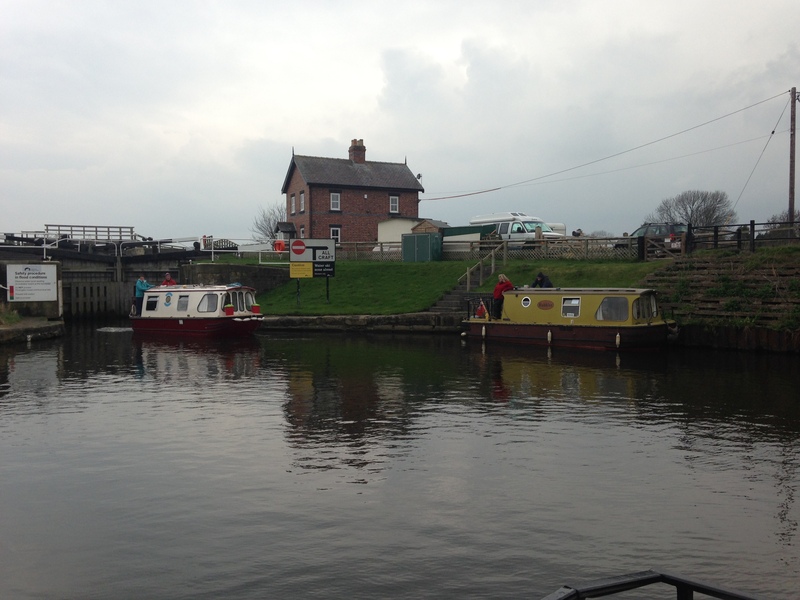 Then we had a 15 minute walk up to the station, via a quick look at the Selby canal lock off the River Ouse. 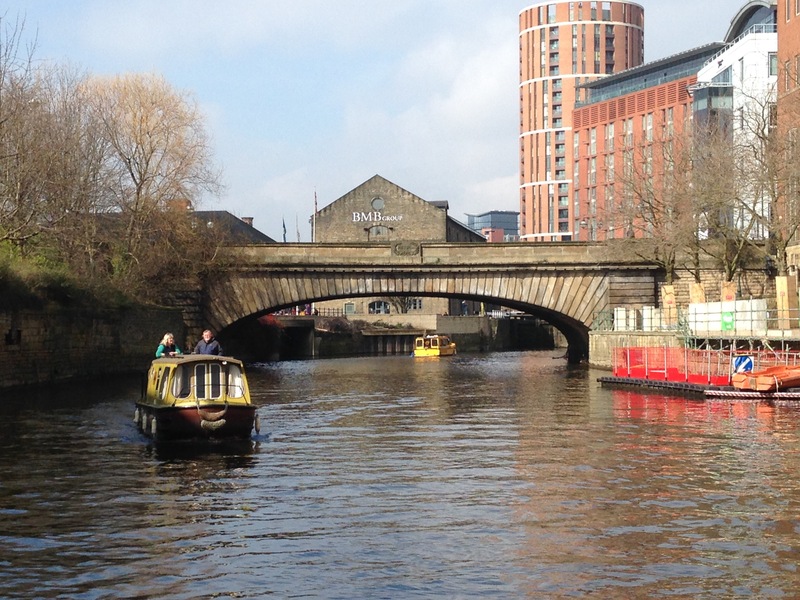 Then a train back with a change at Manchester Piccadilly station to Chorley, where we waited 15 minutes for a bus that never arrived, so we had a 15 minute walk up to the canal where we were collected by one of the boats. 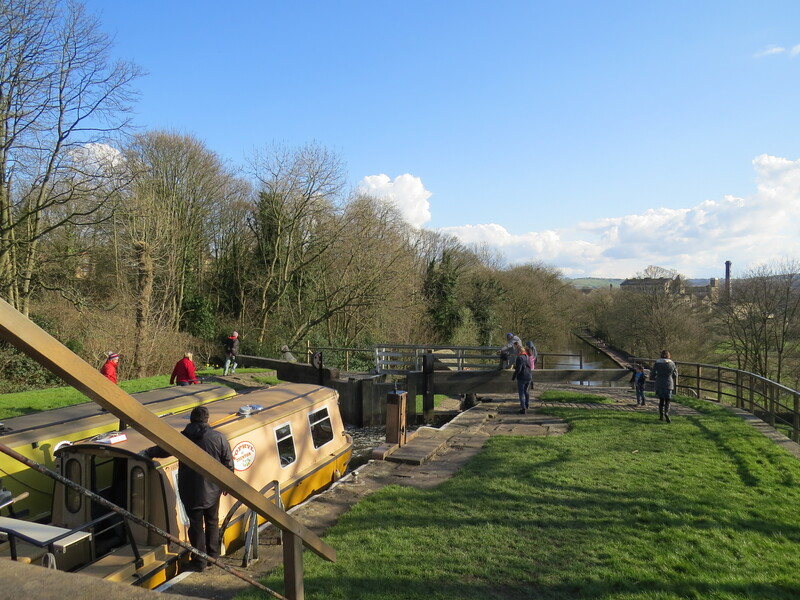 We were back at 3.15pm and by 4pm, after a late lunch, we were headed for the 7 Johnson’s Hill locks, which started just past the pub we had visited the evening night before. 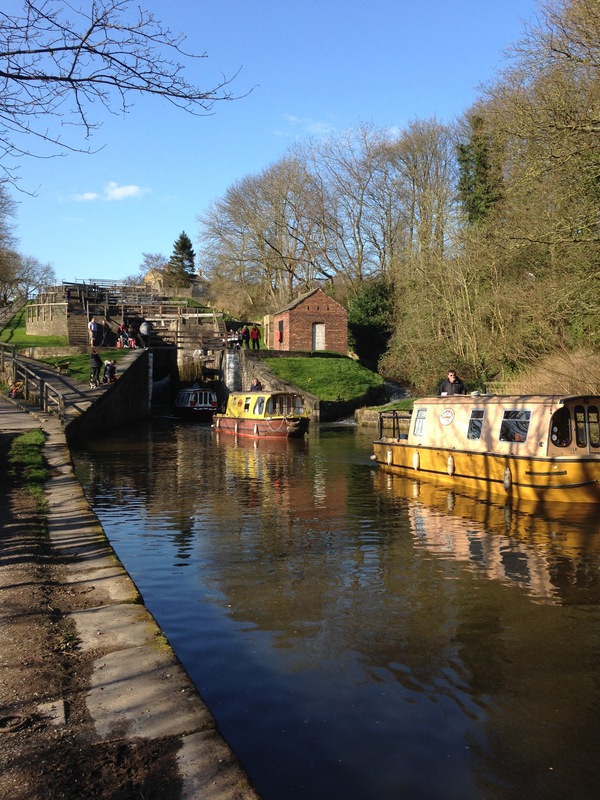 It was only later when reading a book about the L&L canal, that the writer realised that the canal arm on the left of the locks, looking up, with a helpful no entry sign on a chain across it, was in fact where the Lancaster canal joined the L&L and used to run north towards Preston. Although I understand it never got there as the required aqueduct was never built and goods were trans-shipped by tramway. 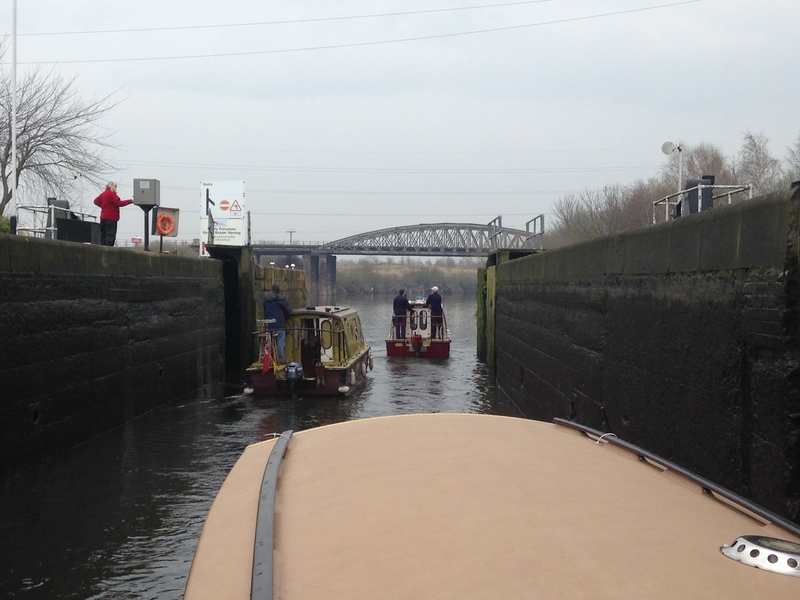 As the sun was out so were the gongoozlers who followed us as we headed up, all three boats in each lock. We moored just after the top lock and at 7.30pm we went into the busy Top Lock pub, where we enjoyed good beer and lovely, tasty, reasonably priced food served by pleasant staff. A quiet night but it was getting windier as dawn approached. 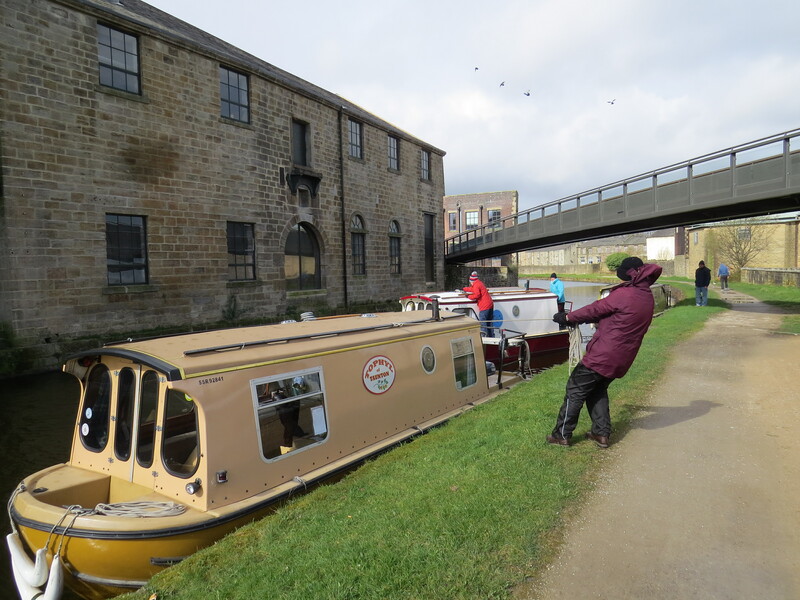 With a weather forecast that promised windy and very wet weather by 11am, we set off at 9am, crabbing up the canal but our trip to Blackburn wasn’t as bad as forecast. Yes it was cool and windy in exposed areas but we only had to put up with misty rain. We made good progress until we got to Blackburn lock 4 of 6, just past bridge 99, where we found the pound nearly empty ahead of us. However C&RT staff were already at the next lock letting water down so we just had to wait for the pound level to rise to continue our journey. 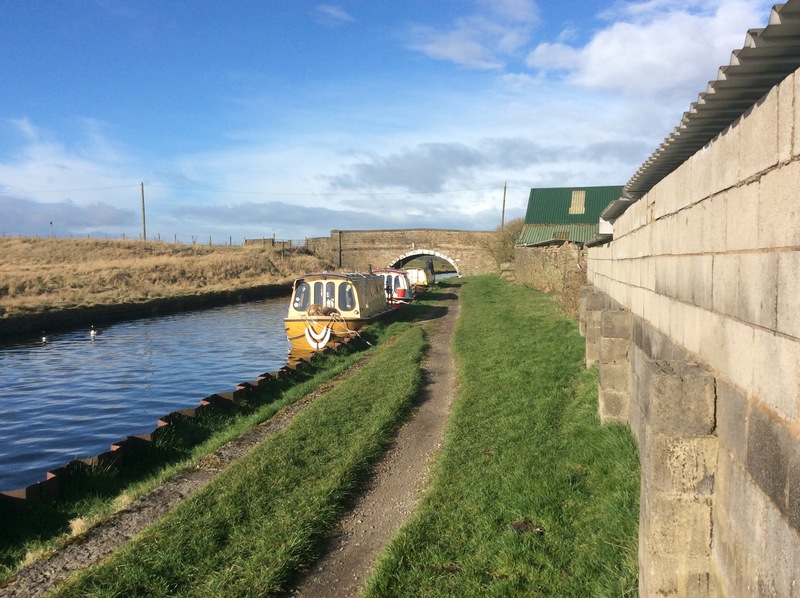 After about a half hour wait, we continued on our way and were soon cruising through Darwin, Rishton and Church, where we encountered the first of three swing bridges. As we passed through the last of these, Foster’s 115, it got darker, the wind got up and the rain started in earnest for the first time in the day. In the loop away from the M65, after bridge 117 we started to look for a place to moor up. The concrete edge looks good, but on closer inspection there are lumps of stone just below the surface or a low concrete ledge at water level. Just after bridge 118, we found a steel piled edge that allowed us to get in to moor and just in time too, as the wind got up and the rain came down in stair-rods as a severe squall line crossed us. After a meal together it was time to get to bed early, as it was the night that the clocks went forward, as summer time started. Will the summer weather also start tomorrow?? Up and off at 8am, no not really as it’s now British Summer Time so it’s 9am really. The sun is out but it’s still a bit chilly. If you didn’t know, the L&L canal is contour following and we knew it today. One minute we are heading for the M65 motorway and the next we are heading away, it’s the same with the wind, one moment we are heading into it and the next away. 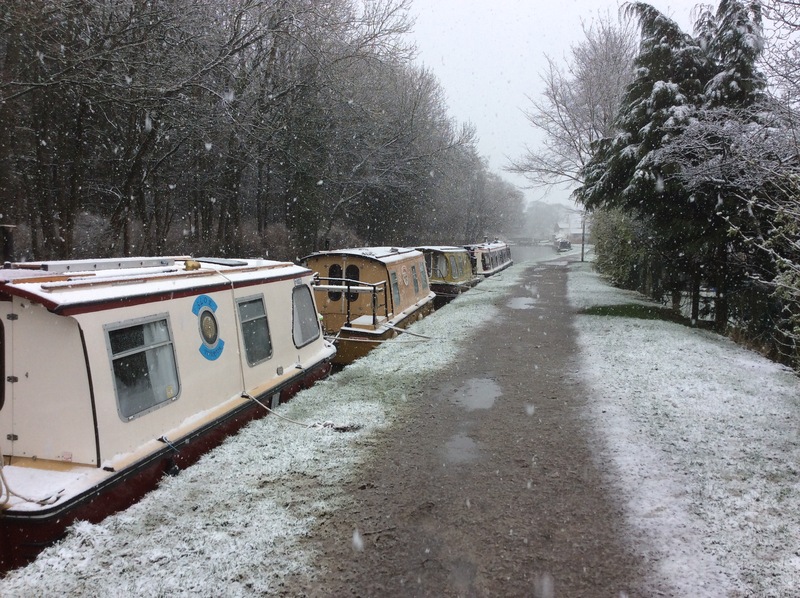 But the twists and turns of the canal had nothing to do with the heavy, squally and wintery showers that started to hit us just after midday. 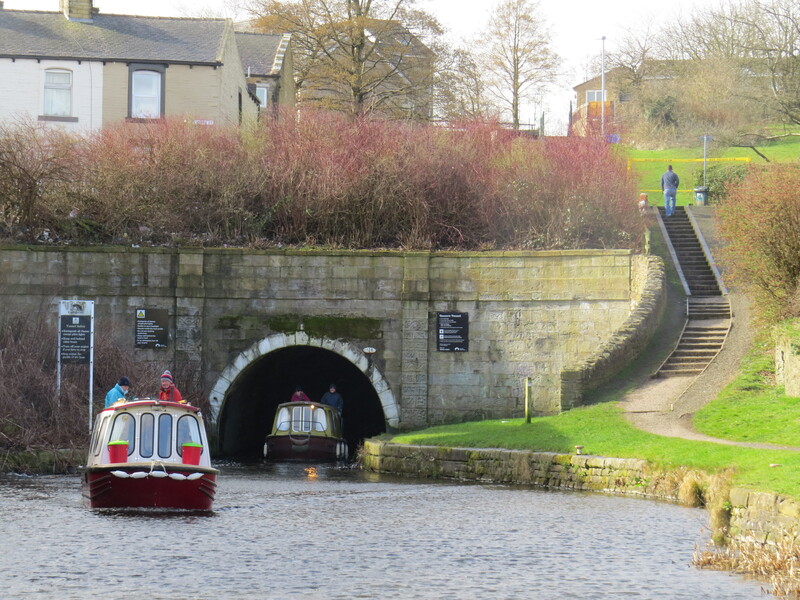 Anyway, we passed through Hapton and into Burnley and went through Gannow tunnel and called at the CRT Sanitary Station for water and other things. At bridge 130A we stopped briefly in a windy corner to look at the beautifully restored mill building with workers cottages built in, now apparently containing offices. Unfortunately, the weavers triangle museum wasn’t open till 2pm and we did not want to stop to kill around 3 hours. We continued on to the straight Burnley embankment, which must have been an amazing engineering achievement in its day. It now has the benefit of having easy access to a very convenient Tesco Extra with 24 hour fuel station about half way along. This embankment gave a very good view of the surrounding area, however today it also gave us a very good view of a rapidly darkening sky as the first of today’s storms approached. We did move off the embankment but stopped after about 10 minutes to shelter from the rain, hail and thunder. Once the rain had gone through, the sun came out and we were off again past a few mills, it was a shame that only one looked like it was still working. 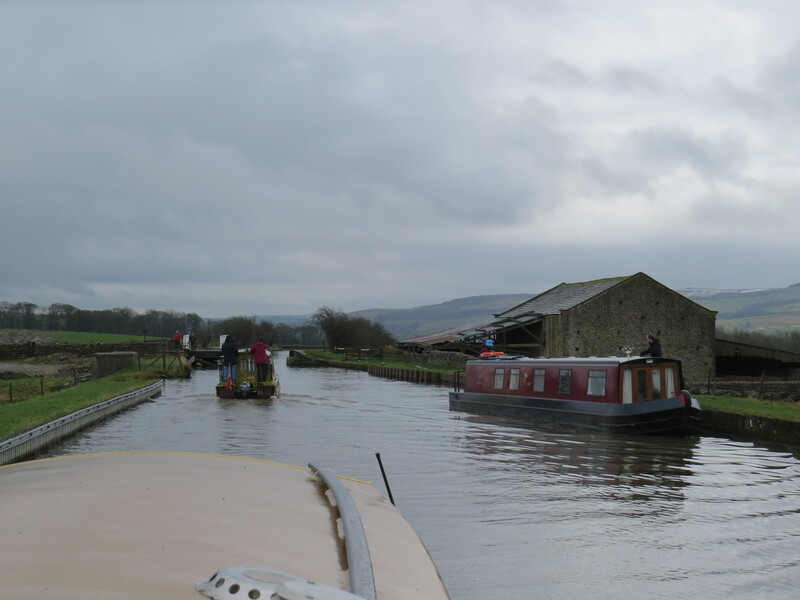 As we approached Barrowford Locks the sky was darkening again and as we pulled in, there was a flash of lightning and the heavens opened. 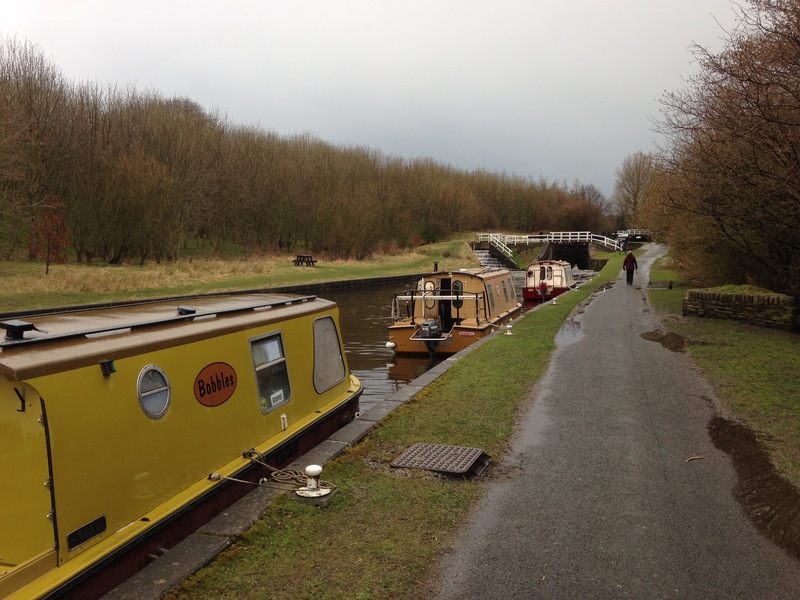 We saw two elderly ladies walking along the towpath and asked if they wanted to shelter, which they gladly accepted and we had an interesting discussion with them about how they came to the area at the beginning of the war and life in the Blackburn area since then, all over a cup of tea. 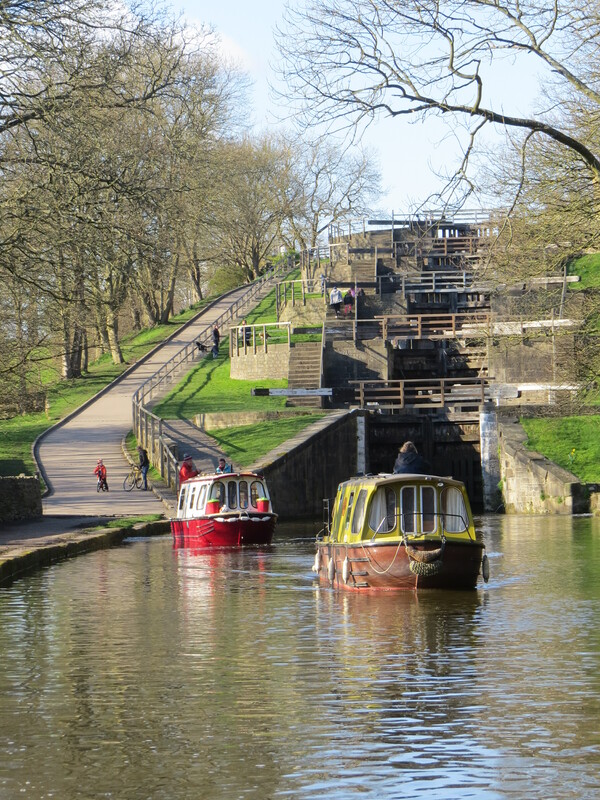 Again the rain turned to sun, so the crews started up the locks and we gave our new passengers a lift up the first lock as an experience. Once the lock was full they left us to return to their car. As we continued up the flight, we started to find that some lock top gates had been left open and/or ground paddles left up apparently by a previous boat. Having reached Foulridge tunnel we were brought to a standstill by the traffic control lights that guard the entrance. We read all the signs but could find no information on how these operated. Eventually, two passing on foot boaters advised us that the lights turn green every hour, at half past the hour for a few minutes. Why couldn’t that be written on the signs or is that too simple? So we had to wait 25 minutes, and sure enough at 5.30pm the lights turned green. Once through the tunnel, it was just a short trip to the moorings in Foulridge village and then four of us had a pleasant meal in the The Warehouse Bistro. Thar she blows!! Thankfully Storm Katie did not really affect us and we only heard how bad things are down in the South of England on the radio and from messages and emails from family and friends. Stay safe down there and thank you for your concern. For us the morning was bright but cold after a night of rain. We started again at 9am with the objective to make Gargrave. The views along the way are stunning. Tophyl travelled this section of the L&L back in 1994, in our first holiday where we trailed to the Lancaster and then up on to the L&L at Silsden but we cannot remember it at all! We soon made the 3 Greenberfield locks and were on our way along another beautiful but twisty section but have now gone over the top. After passing the Double Arched bridge at East Marton we passed a TV mast, and around a bend we spy the next bridge No 164, off to the right but not so far in the distance. But then around the corner we passed the TV mast again on the other side of the hill, then we go around another hill and another valley before finally reaching that bridge we saw 30 minutes ago! 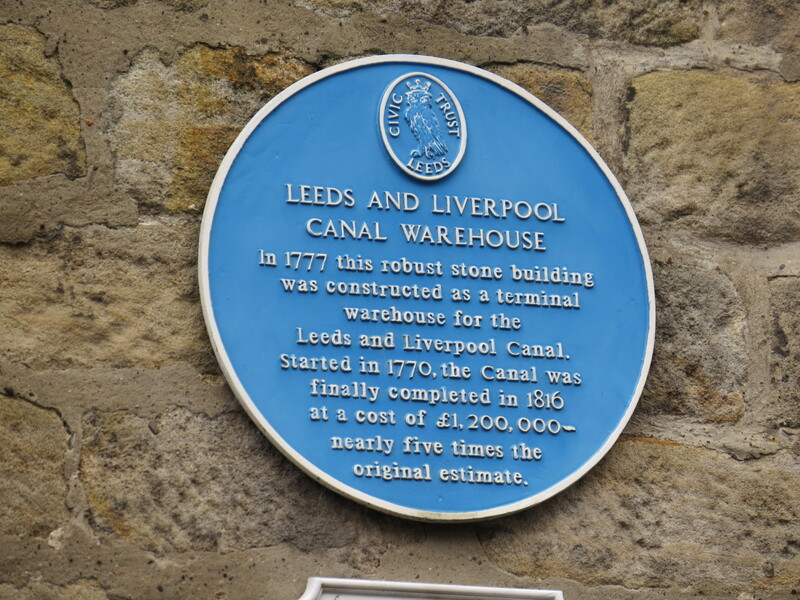 It’s a wonder that the L&L canal company never reworked these loops to straighten the line and quicken the journey like they did on the Oxford, to be more competitive to the railways. As we headed for Bank Newton locks, we pass a hire base who decide to wind a boat right in front of us with no apology and when questioned about this manoeuvre say we were travelling to fast past moored boats. 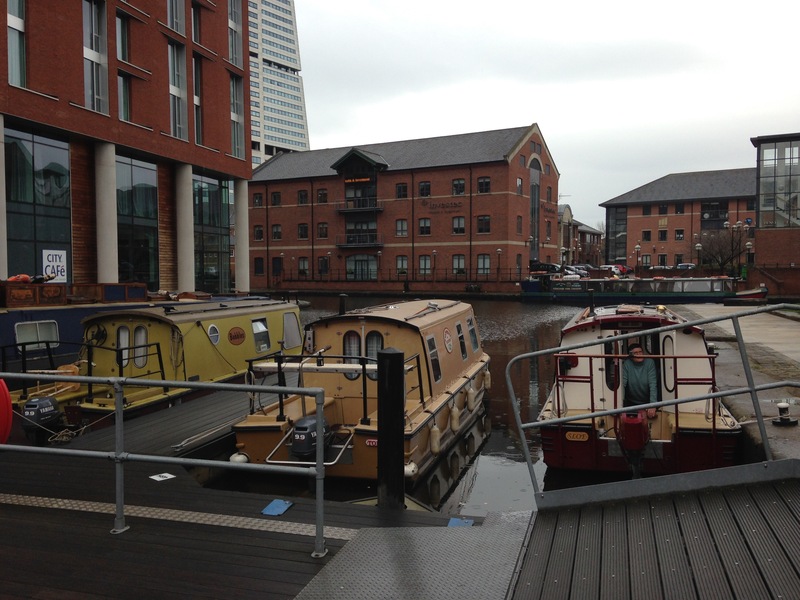 The fact we are at tick over and cannot go any slower makes no difference, they also have no understanding of the difference of displacement and draft from a standard metal narrowboat which weighs 40+ tonnes and a draft of 24 to 30″compared with ours of around 1 tonne with a draft of 3″ to 6″ which means we effectively skim over the water and have much less resistance so travel quicker with very little power input. We feel like it might be worth producing a leaflet to hand out to such complainants to explain the science! 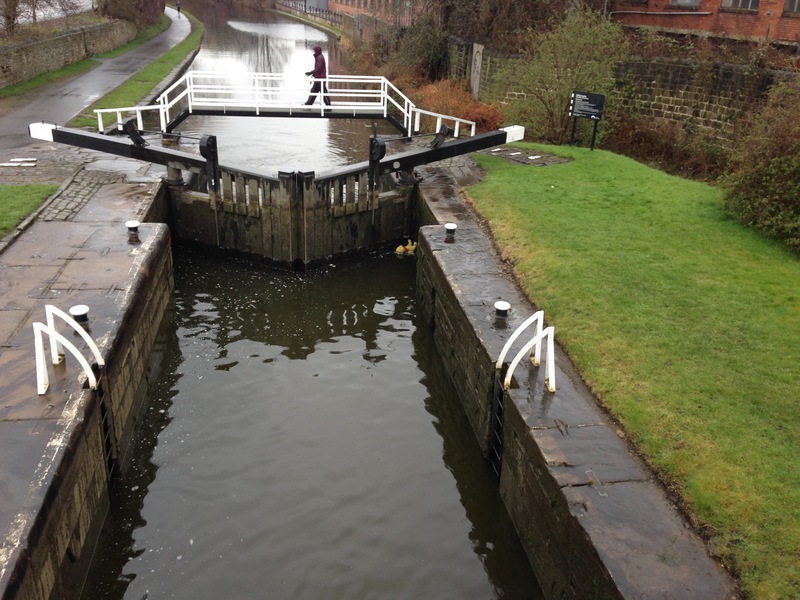 At Bank Newton locks, the wind is making it tricky in some places to get off the bank and in others to get in and land, however the local CRT lock keeper who is doing lots of maintenance to the flora and fauna, is happy to break off and set the locks for us down the flight. Thanks very much. After lunch by Priest Holme railway bridge, (on the Leeds, Skipton, Morecombe, Settle and distant Carlisle line) we move onto the three locks dropping down to Gargrave. At Scarland lock No 34 we run into a spot of trouble. Tophyl has a wood fender halfway down its side, unfortunately in this lock, this gets caught on a projecting piece of metal as the wind pushes it and the boat alongside, on to it. We suddenly realise that it’s caught but before we can drop the paddles, mainly due to the fact that these all have the BW reduction gear on, which make it impossible when in such trouble to stop water moving quickly, the wood splinters and gives way. Luckily, the GRP is not damaged, unfortunately the wooden fender was only painted last week before being replaced after the GRP was painted!! 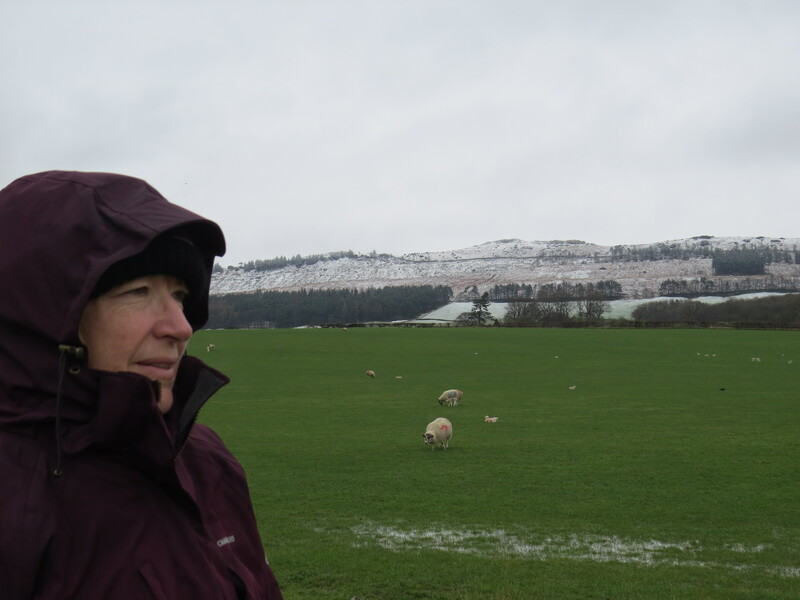 We make it to Gargrave without any further mishap and go for a walk around the village to see if we can find somewhere for dinner. 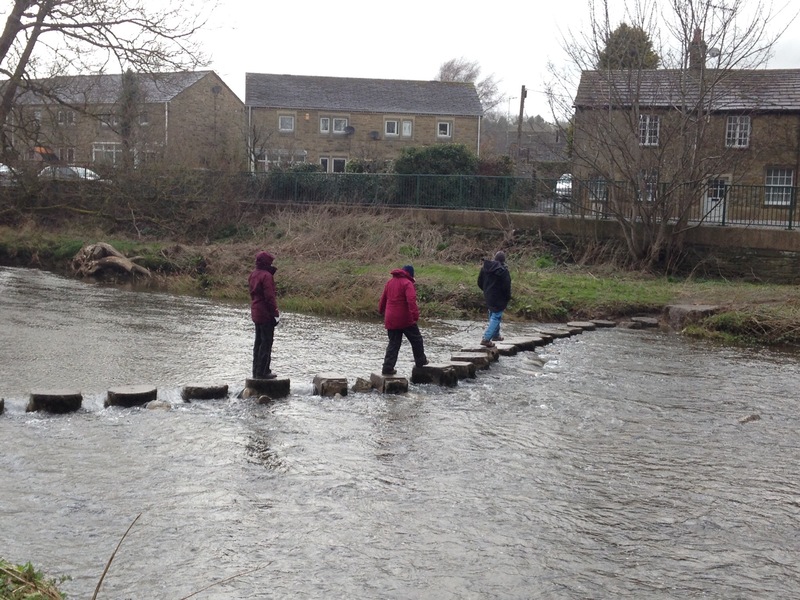 On the way back from booking a table rather than crossing the river by the bridge, the big kid in those present, means we cross by the stepping stones. All without getting our feet (or anything else) wet. Well we agreed last night that we were going to start this morning at 9am but by 8am we had steady rain falling so our start was delayed till 10am. 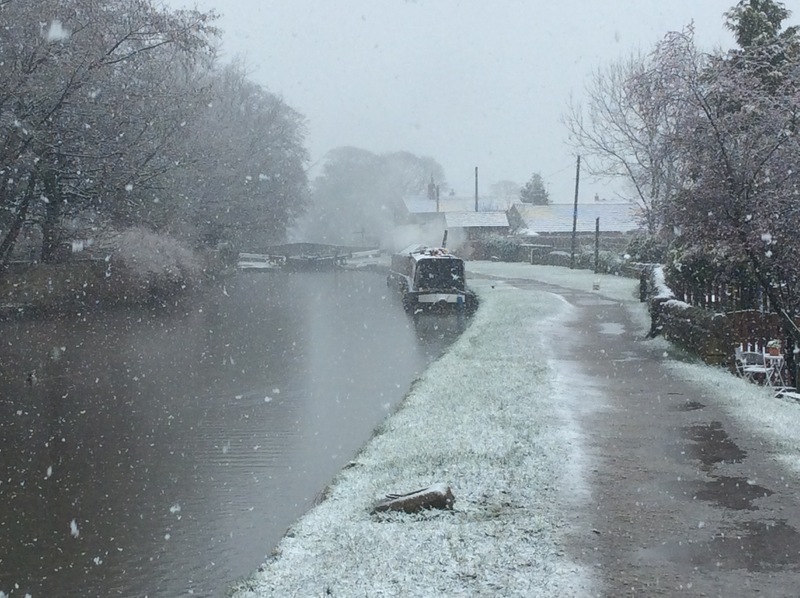 However a look at Twitter showed that it was snowing in Chorley and on the top of the Pennines. As time passed we started to see the odd large snowflake too, in amongst the rain i.e. it was sleeting. But within a few minutes it was proper snowing and pitching too. And so it went on and on until it suddenly stopped around 10.15am. This just goes to show that what the Met Office usually say before Christmas, that you have a greater chance of it snowing at Easter than at Christmas. It does help to be up’t North as well as halfway up or down a mountain. Once it had stopped we moved down to the Sanitary Station to fill up with some water. Right alongside the canal was a nice new stainless steel water tap post. Opening it up however gave us a problem, the tap was not the usual 1/2″ BSP screw connection, but something much larger. It said 3/4″ on the side. It’s the first time any of us had seen such a fitting for water and none of us had anything like the size on-board. Hunting around we then found what is apparently was the old water outlet in a box built into the wall about 5 yards away. This produced rusty water when first turned on, but eventually ran clear. Why have CRT put in this new post? Is it going to be a new standard fitting? 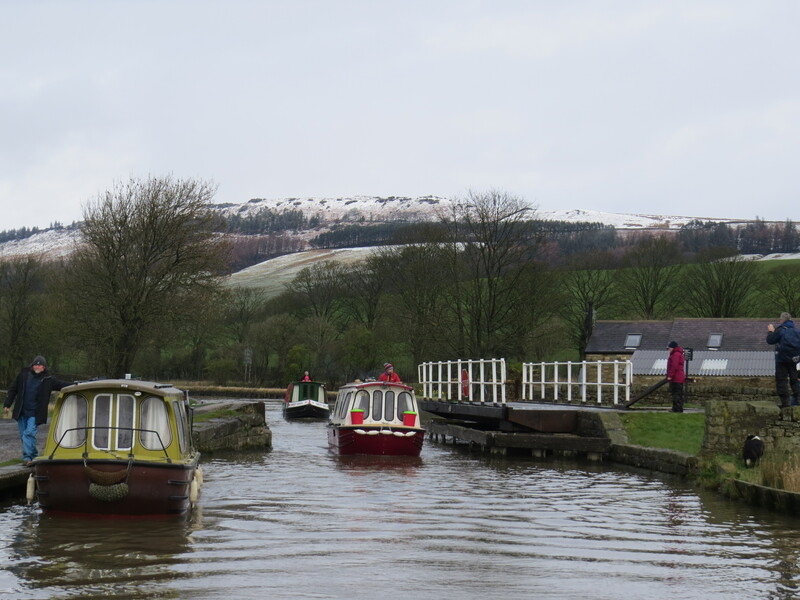 Once we had filled up, through a mixture of snow, sleet, rain and sun, we headed for Skipton, taking care not to slip at the 3 locks and 4 swing bridges on our way to our mooring alongside the aqueduct. 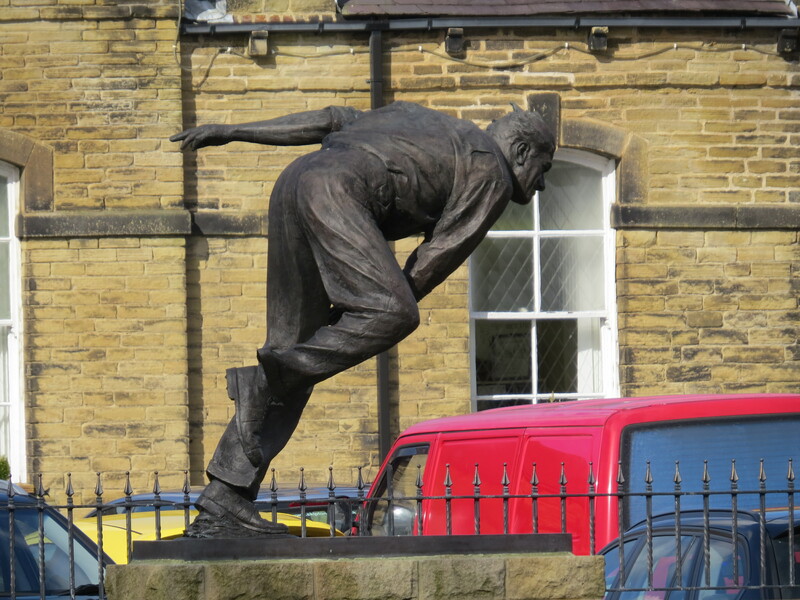 This being a “free” afternoon, in bright sunshine, to explore the delights of Skipton. Well we had a day off from boating today. Tophyl’s crew had requested a stop to go on the Worth Valley Railway at Keighley, where the Railway Children was filmed. 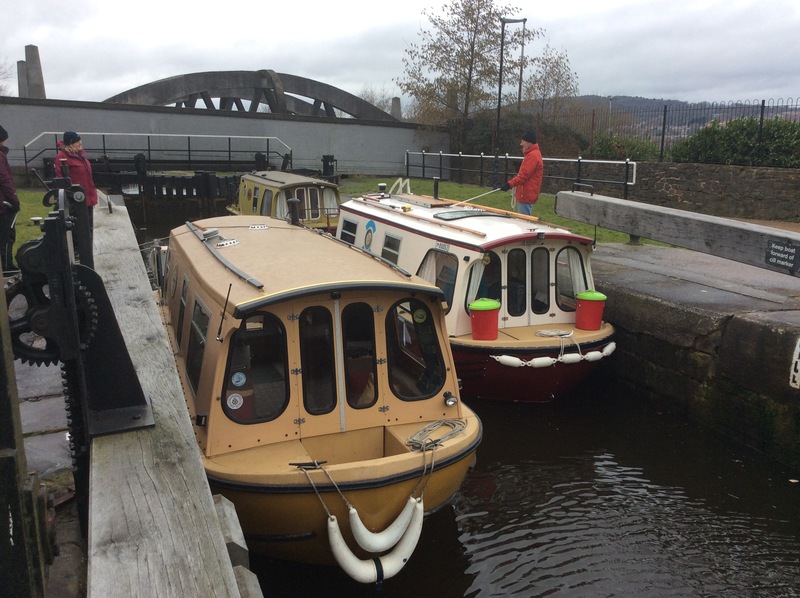 Bobbles captain came up with a cunning plan, where it was thought, as the possible moorings opposite the Keighley railway station may be limited, that it would be easier to leave the boats moored at Skipton and let the train take the strain. So that’s what we did. A five minute walk to the station, a fifteen minute train trip to Keighley, a short walk over the bridge and we were on the Worth Valley line. Careful studying of the timetable over a pint of one of five possible Timothy Taylor brews the night before at the lovely Timothy Taylor’s pub/restaurant The Woolly Sheep in Skipton, we managed to visit most of the major stations and museums on the line, including after a steep walk up to the village, the Bronte Parsonage museum at Haworth. 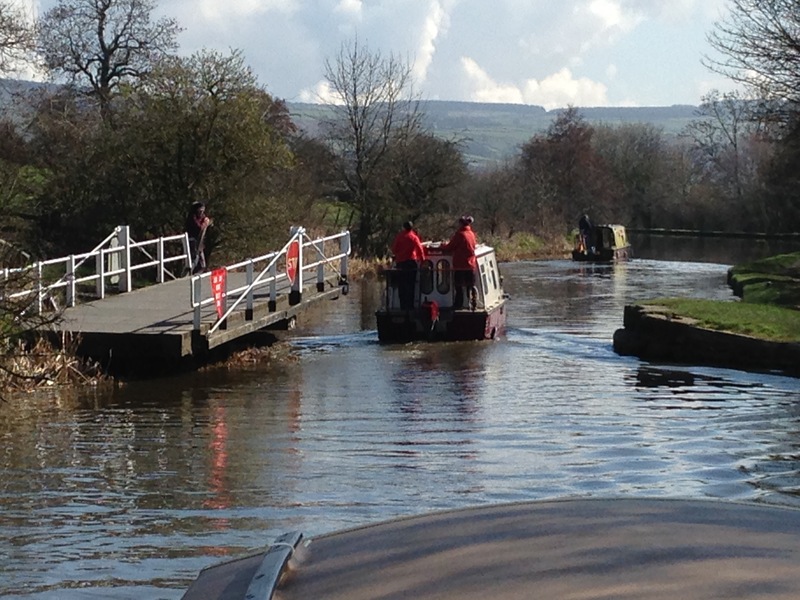 After a fun time, we were back on our boats by 4pm, where some crews had time to replenish supplies of gas and petrol. 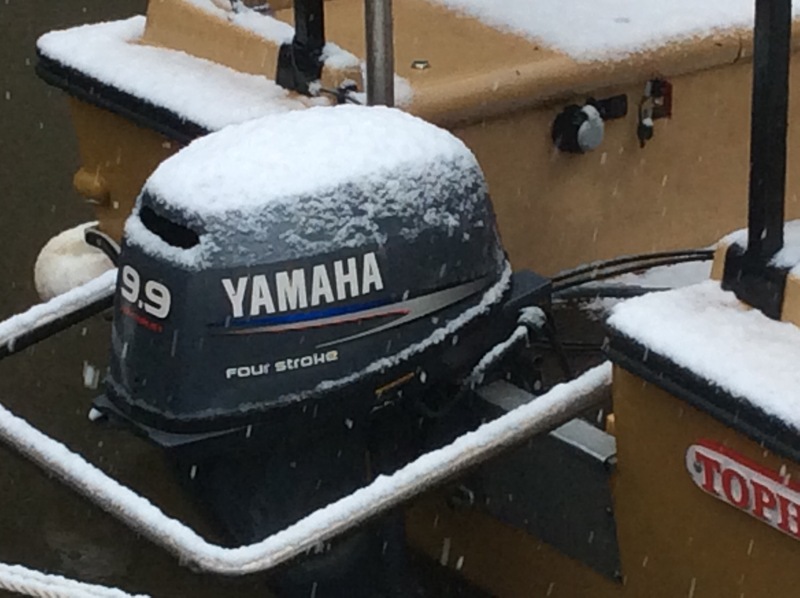 Back to boating tomorrow. What a difference couple of days make. Snow two days ago, bright warm sunshine today and all day. 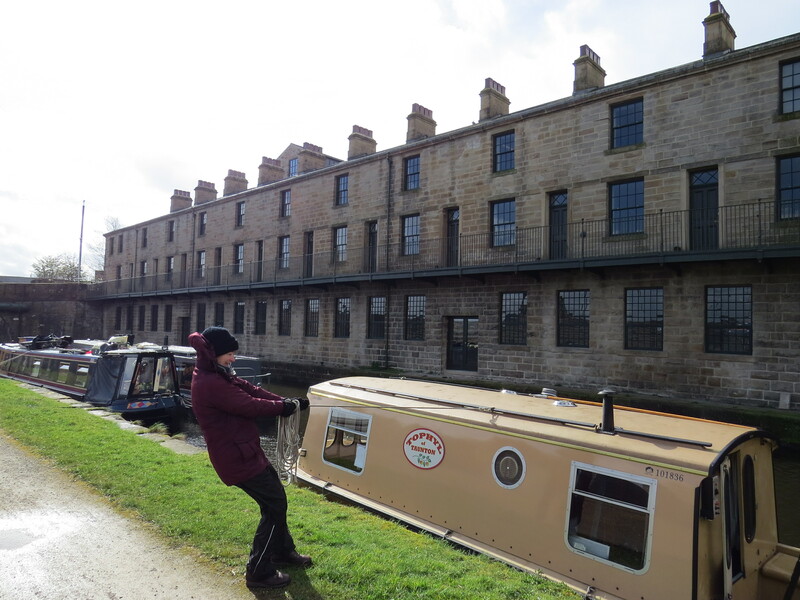 Starting at 9am we travelled from Skipton all the way past and down Bingley Five and Three rise locks and finished with only three locks and two miles to get to Saltaire. The Sun came out and we actually cruised with no coats or leggings on and it was nearly warm enough to take off our jumpers. We stopped and had lunch on the canal side sitting in deckchairs AND it felt WARM under a clear blue sky. If we had had some suitable food, we could have BBQ’d! We had some “interesting” times operating the multitude of swing bridges along the way. All different, with not always clear instructions, especially on the more complicated fully automatic ones, when barriers didn’t come down or didn’t quite go fully up and so didn’t release the key. 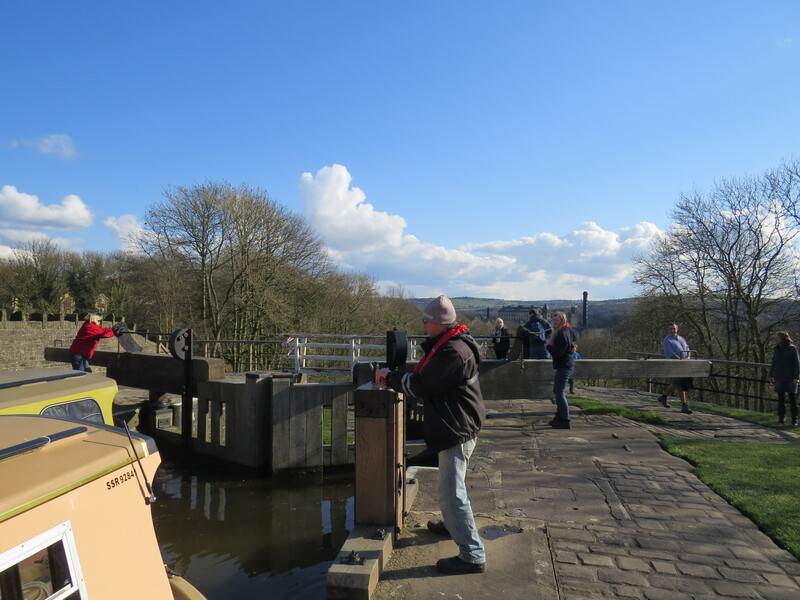 And finally for some they had their first trip through the Bingley Five and Three rise locks in twenty three years of cruising. 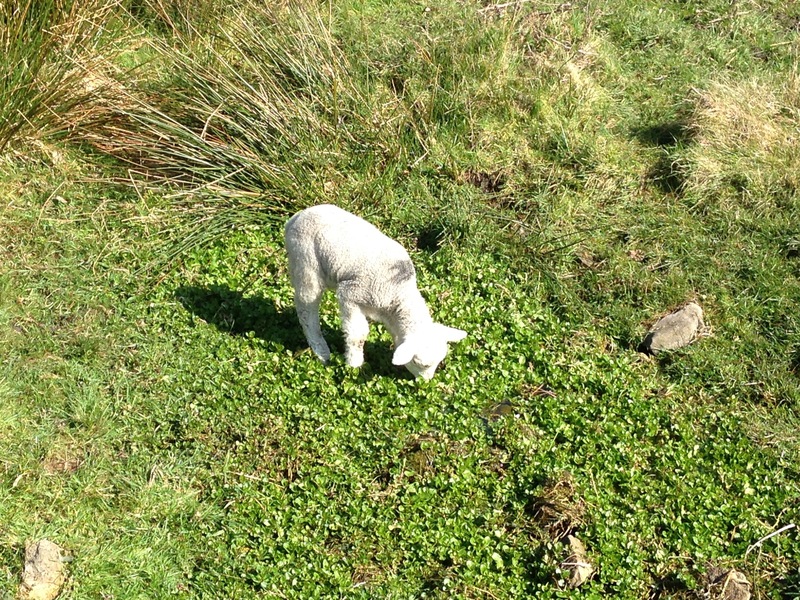 To sum up a lovely Spring day’s cruising. Awoke after a quiet night to a cool, cloudy but bright day. Moored next to a nice patch of grass just upstream of Scourer bridge 205 with just a few yards to travel to Dowley Gap locks. 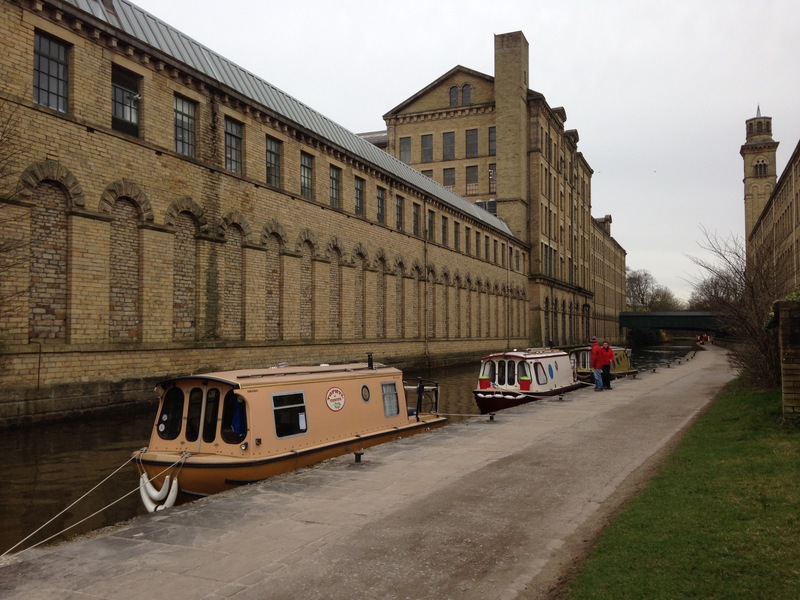 So just 3 locks and a swing bridge to reach Saltaire, the world heritage site of Titus Salt’s factory and workers housing. We stopped to visit the various museums, galleries and shops now occupying some of the floors of the factory that closed in 1985 and then had a walk around the village following a free guide from Tourist Information. The purchase of the empty factory by Jonathan Silver in 1987, who rented out various parts of the buildings and established an arts centre on the site, not only restored this beautiful building, it made the houses built by the Titus family, and originally sold off in the early 1900’s, desirable places to live in the modern age and combined with a centrally located railway station, a commuter centre for people working in Leeds. Moving on at 2pm, the cold wind had got up and we had the odd shower as we headed on down the Airedale valley, passing many more swing bridges interspersed by the odd triple or double sets of locks. 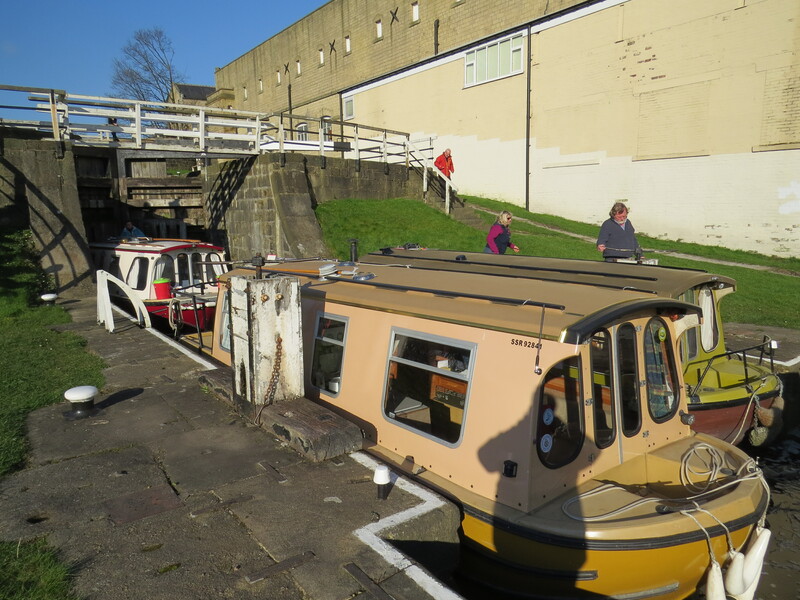 As we left the Apperley bridge and Dobson Locks, we were advised by a passing CRT employee not to go past Rodley as it wasn’t safe to stay overnight between Rodley and the Newlay locks, which are locked overnight. 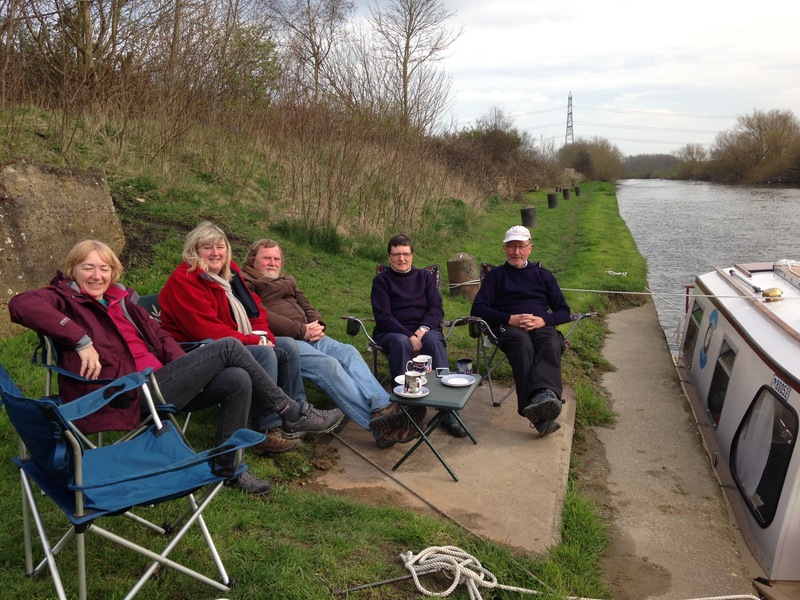 So we moored up just before getting to Rodley. Tomorrow we head for the centre of Leeds and the end of the Leeds and Liverpool canal, meanwhile looking towards Rodley, it’s raining! Urg! What time is it? The alarm has just gone off at 6am! 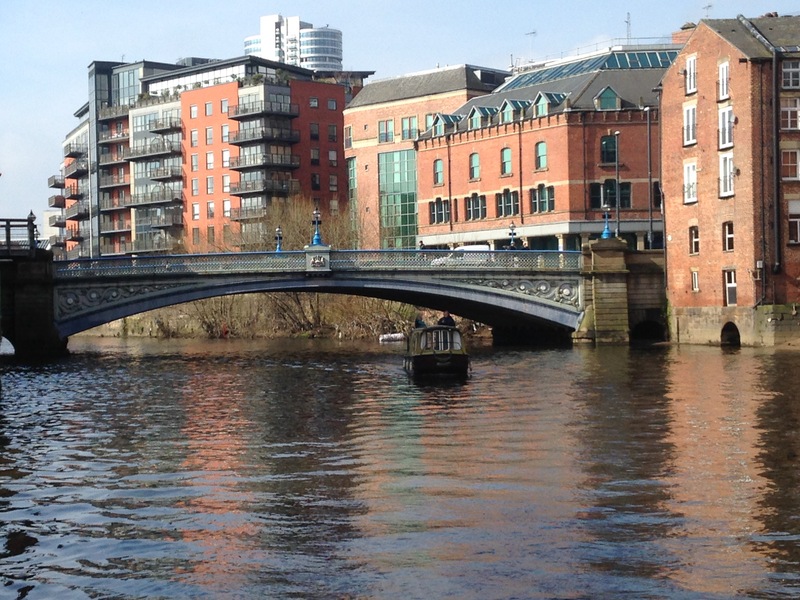 Oh yes, we decided last night that we were going to have an early start to get through the bandit county section between Newlay locks and Leeds Centre before the bandits were up and about. 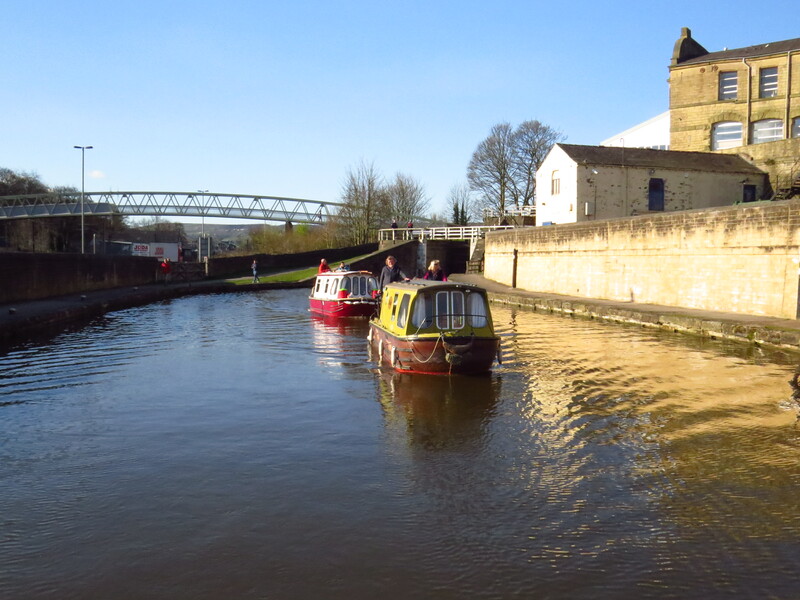 So being that we moored just outside Rodley before Owl swing bridge 216, we had a run of about 50 minutes to get to Newlay locks (13-11) which are unlocked by CRT at 8am. So we were off at 7am, and by the way the good news is the wind had dropped but the bad news is it’s still raining. We arrived at Newlay by 7.50am and CRT were busy getting the locks ready and we went in on the dot of 8am. The two CRT guys saw us through Newlay triple and Forge triple and then we were on our own. 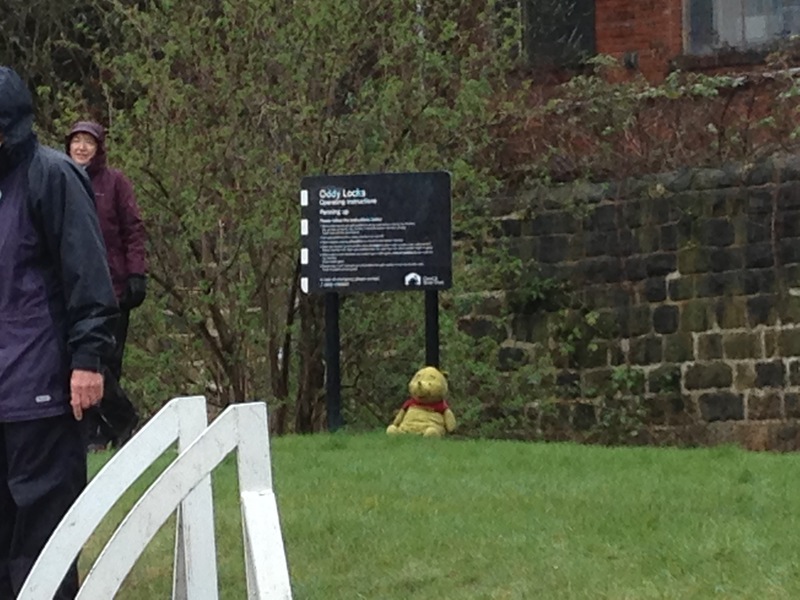 And how many bandits did we see as we headed into Leeds? Well unless you count the many people running and cycling in the rain, none! 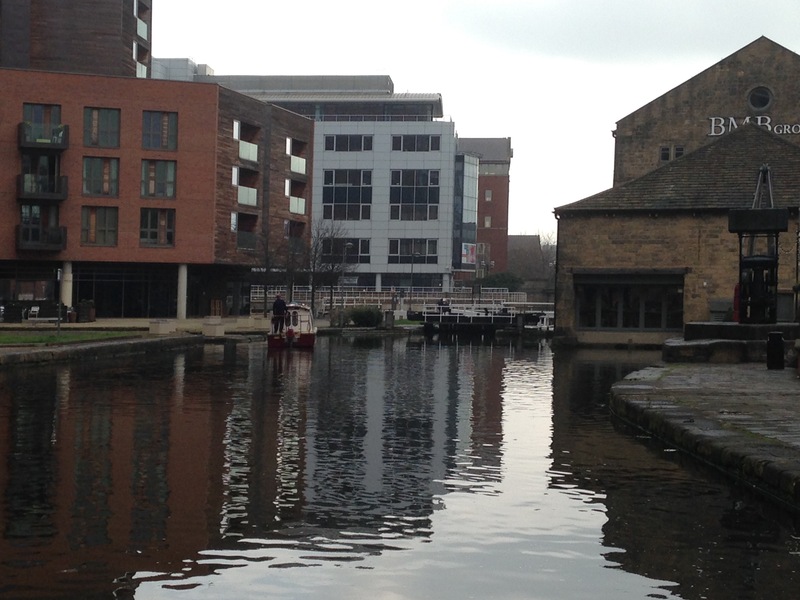 So quite an uneventful trip with us arriving at Granary Wharf, between Office lock 2 and River lock 1 at around 11.40am. 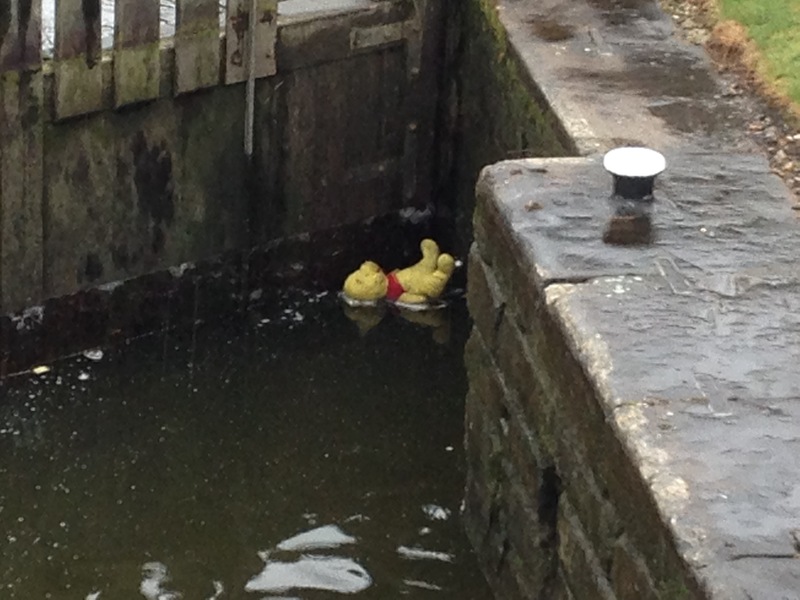 The only thing of note was we found Pooh Bear practising his back stroke in the bottom lock at Oddy Locks. So we fished him out and left him to dry leaning up against CRT sign. 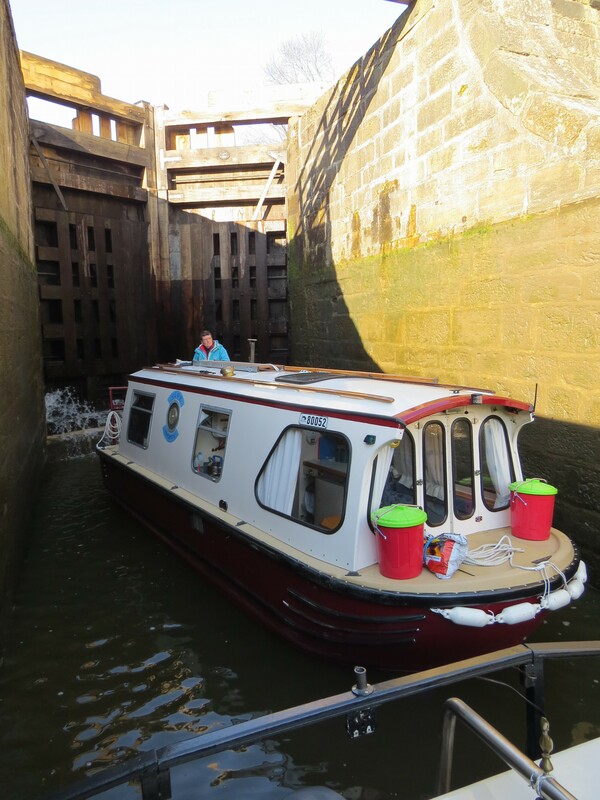 The top lock at Oddy also had a water point situated on the offside and as it wasn’t busy boat wise (we never saw one moving all morning), we took the opportunity to fill up before arriving in Leeds. 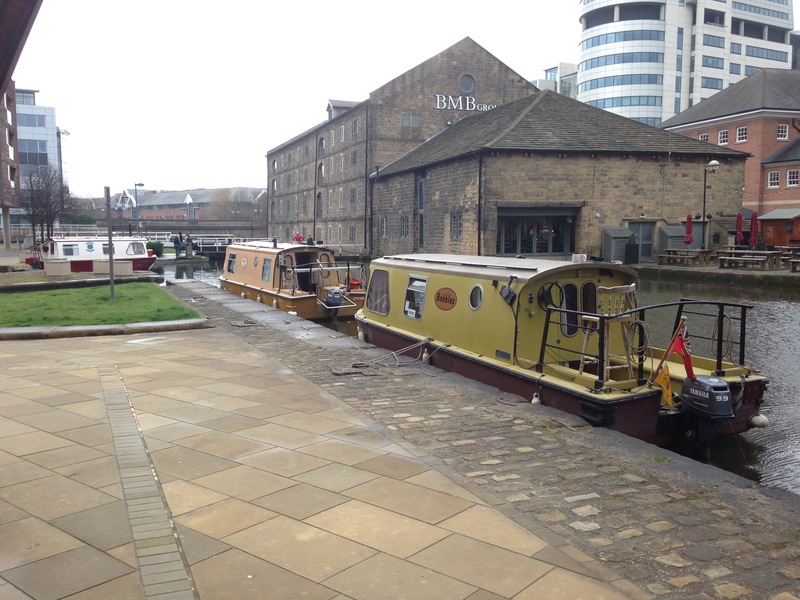 The Granary Warfe moorings seem to be busy with people and trains passing, we shall see how disturbed we are overnight. Still it’s a posh district as we moored adjacent to the Hilton Hotel. After a nice curry last night from a restaurant under the station, we have had a lie in to make up for the early start yesterday. This proved to be a good mooring and had a reasonably quiet night with security around. Around 10.30 then we cast off and headed for River Lock (1) and for us the end of our cruise along the Leeds & Liverpool canal. 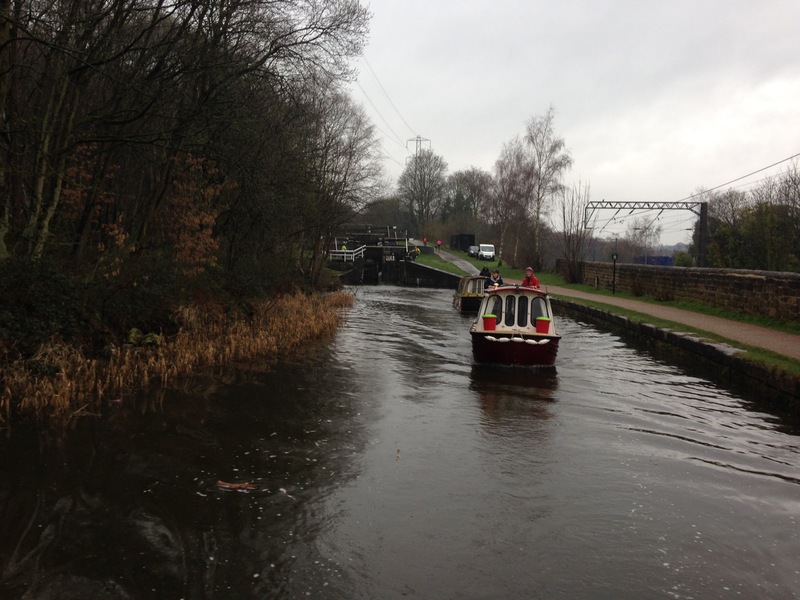 Now it’s time to enter the Aire and Calder navigation. 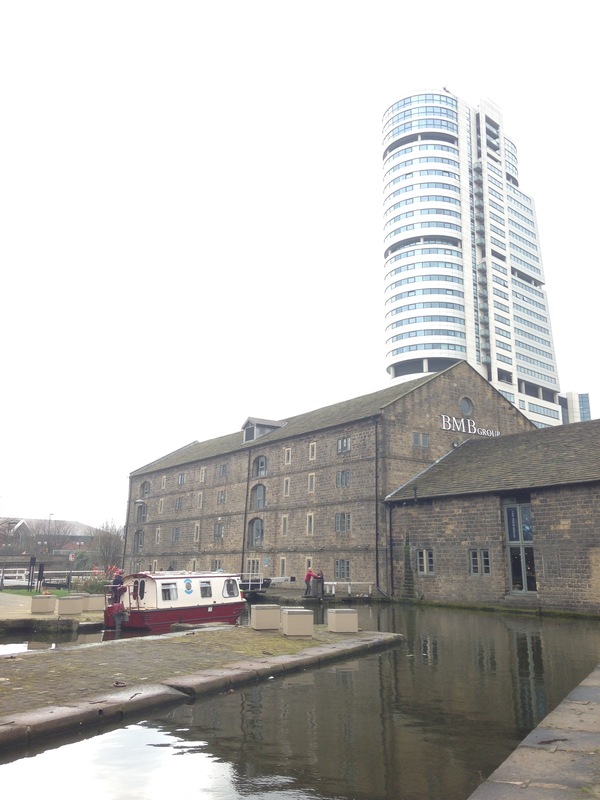 As we start our cruise along it, we all looked around and commented on how much Leeds has changed over the last 20 years, with lots of new building. There is evidence in terms of flotsam and jetsam in the bushes and trees along the bank of how high the river had got during the winter floods, this is further backed up by the damage done to the entrance to Knostrop Flood Lock and the Lock island itself. 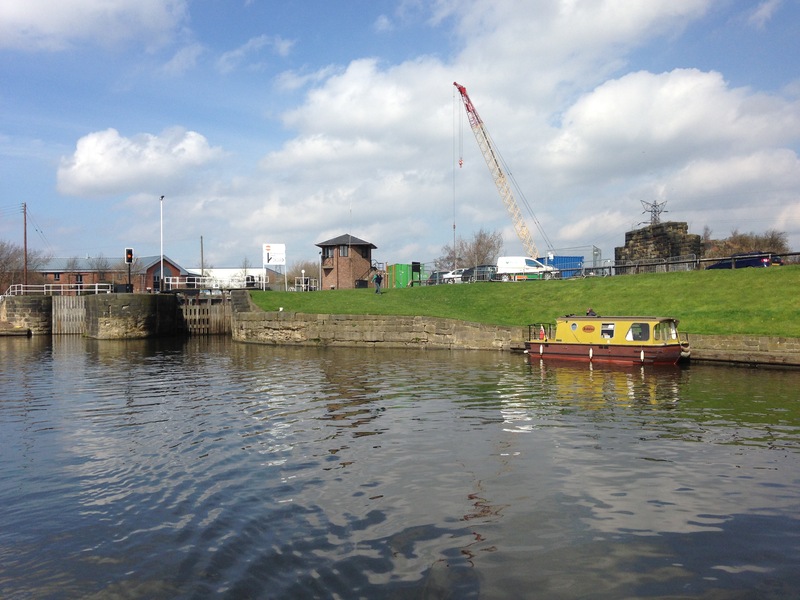 CRT contractors are busy, even on this Sunday, reconstructing the lock infrastructure. We continued on down this now placid river through the self service locks, until at around 3pm we eventually decided to have break at The Boat, which extended into an evening meal. To gain access to this pub at Allerton Bywater, we moored up at the site of the loading staithe, which had been a loading place for the Tom Pudding coal barges but has now been made into a sensory garden by the local village. Here we celebrated the birthday of one of our members by eating some of his birthday cake. Our overnight mooring location seemed to be a success. The river didn’t seem to rise or fall through the night, even though we had some light rain overnight. 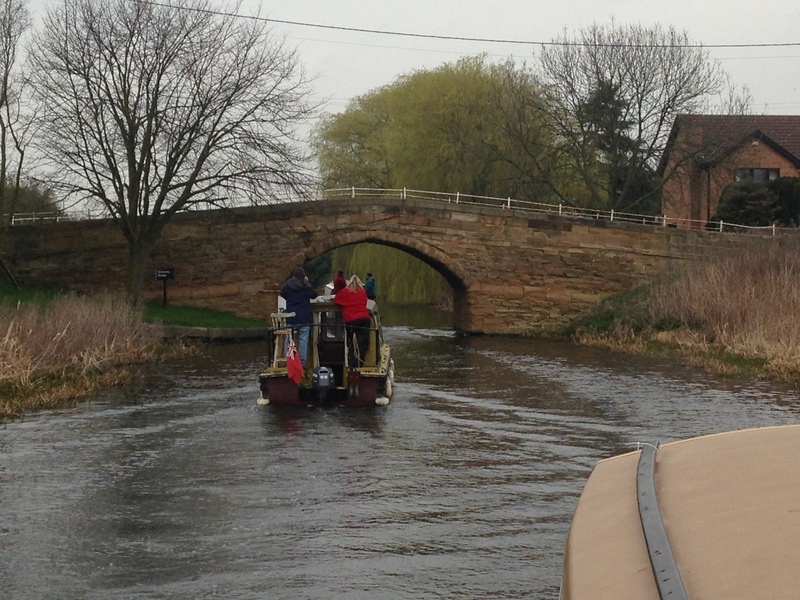 We were back to our standard start time of 9am and we set sail on a bright but cloudy final days cruise to Selby. 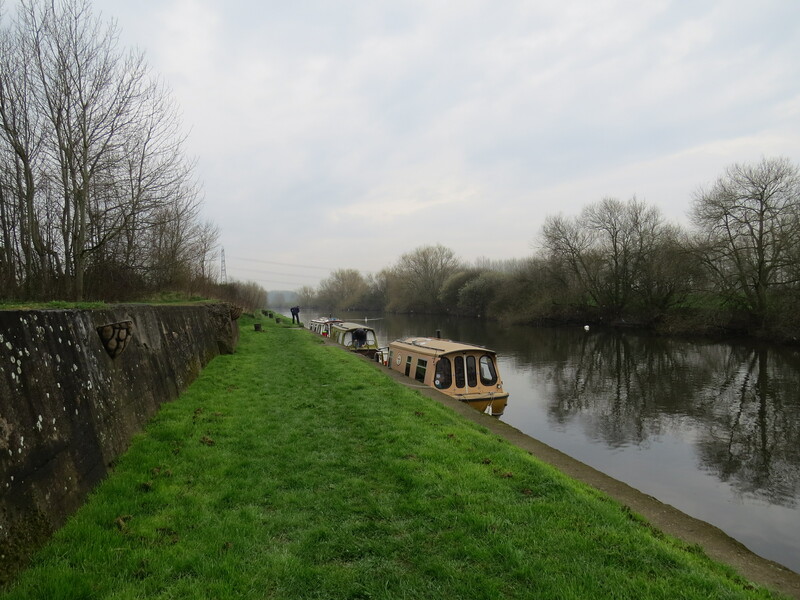 Our mooring was only about a mile or so from the entrance of the canalised section at Castleford Junction, as we approached the flood lock it opened and we passed through without hindrance, but at the other end we had to operate Bulholme lock ourselves. 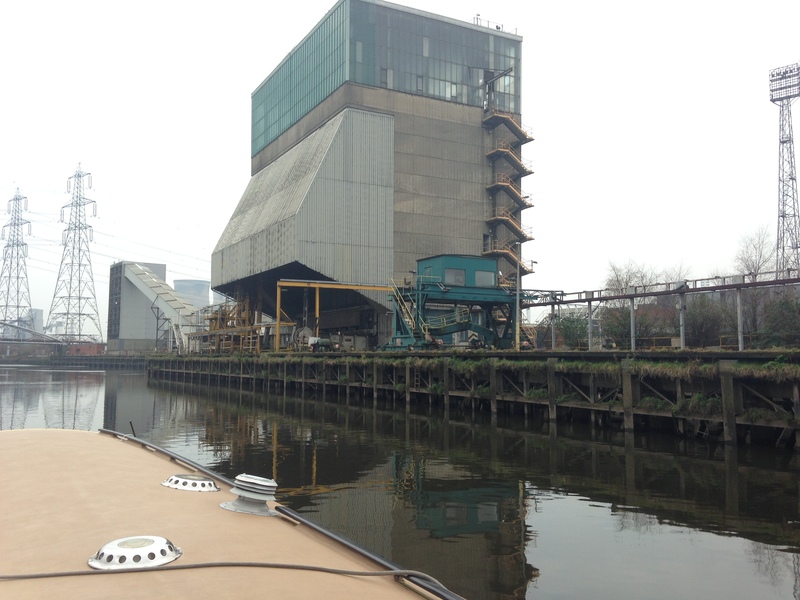 Back on the river, we were moving along with the flow at an easy pace, past the now silent Ferrybridge “C” coal power station, which ceased production on 31st March 2016, only a few days before we got here. After a couple more locks and a very twisty river section we are at the junction to the Selby Canal and off the river. This canal has some lovely features, stone bridges, syphons connecting local drainage ditches either side of the canal and some kingfishers and hedgerows. 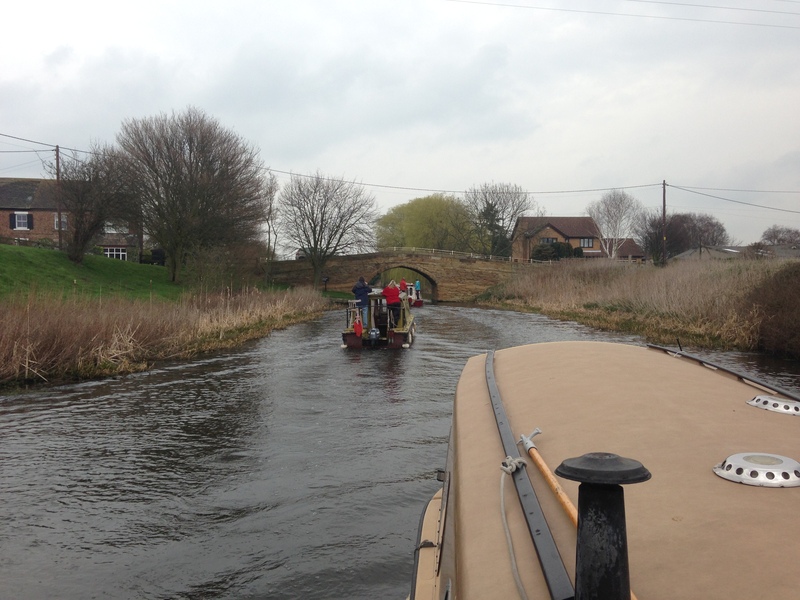 As we approached Selby, the countryside falls away fairly quickly and we are soon past Homebase and have reached our slipway at Selby Boat Centre. 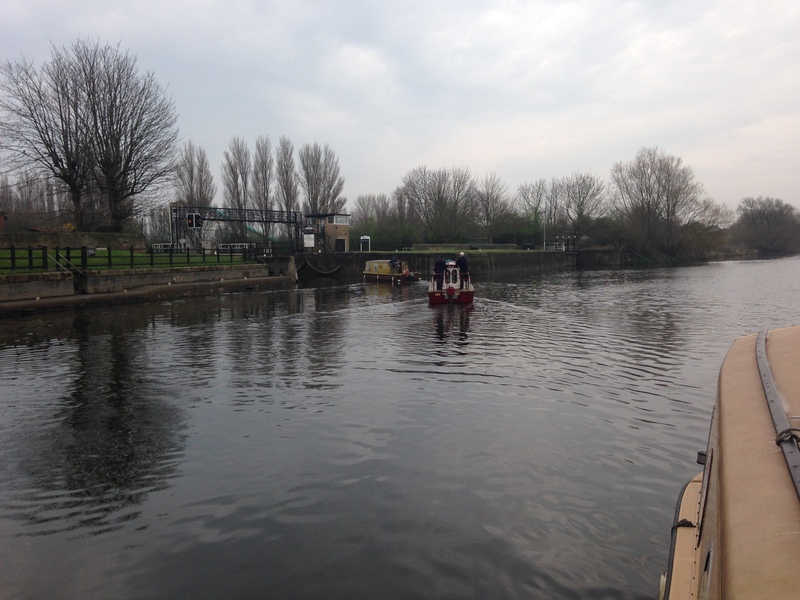 After confirming our time of pulling out tomorrow, we head for the basin in front of the lock onto the Ouse. Not for us however, this time around. If you have been reading this account of our trip, thanks for reading. Finally thanks to all those who accompanied us on this trip. It was a really enjoyable experience.